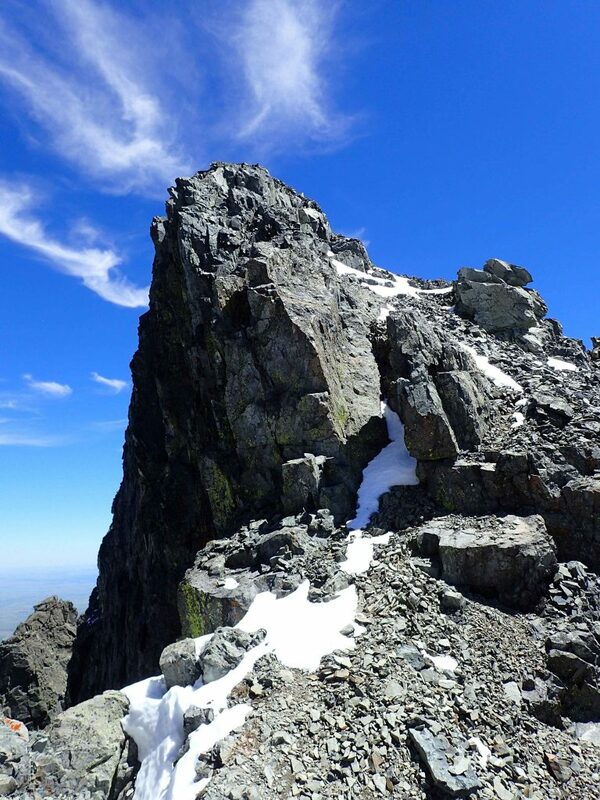 The literal and metaphorical pinnacle of my adventures up North was a climb of Crazy Peak in Montana. 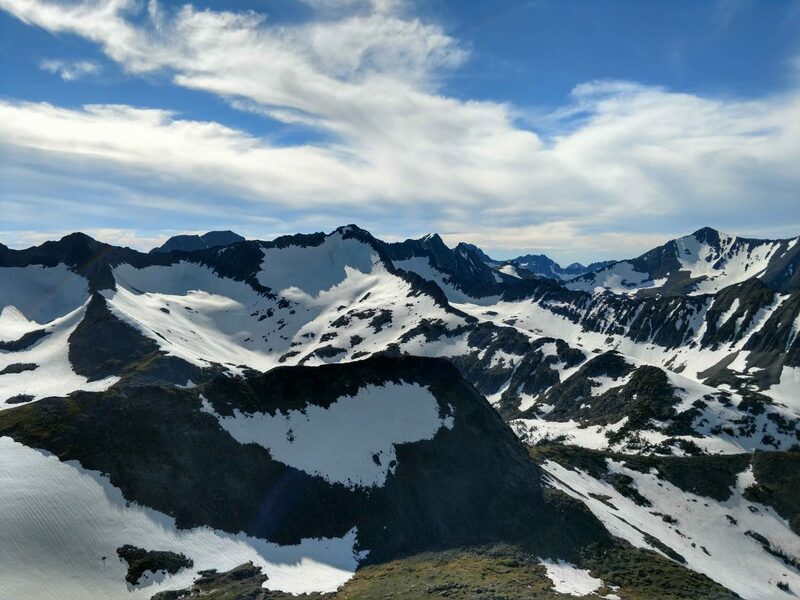 This isolated alpine summit rarely sees visitors and was an outstanding climb. 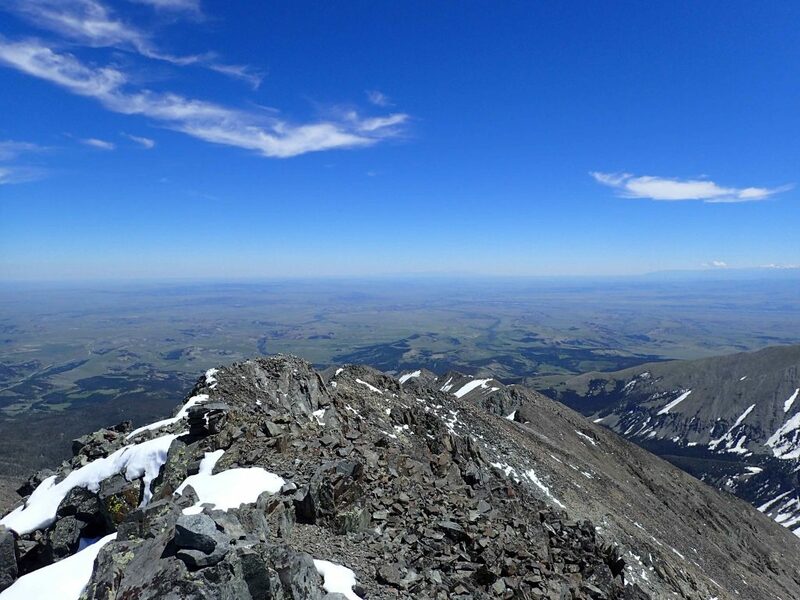 Crazy Peak is a lonely summit that intrigues travelers as they head across Interstate 90 through Montana. 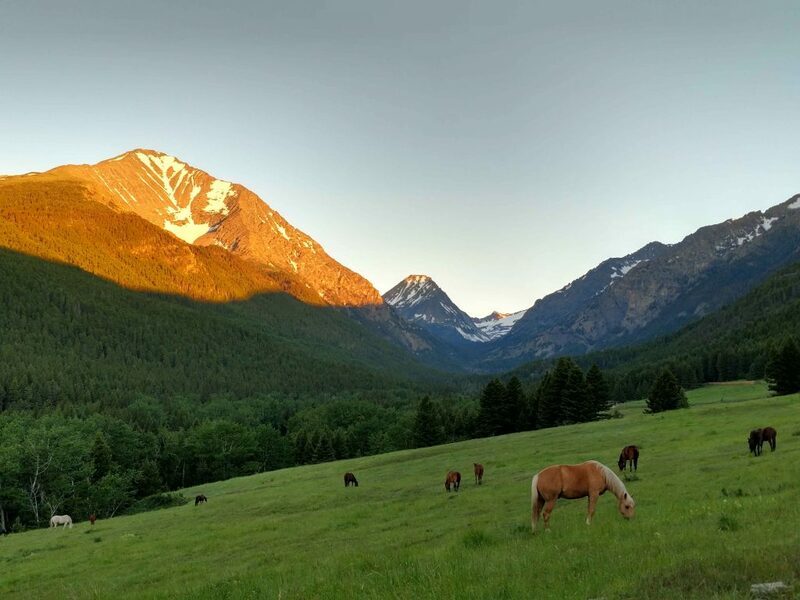 Rising abruptly from the pastures and rangelands dominating the scenery, its no surprise that Crazy Peak is the most topographically prominent summit in Montana. That bizarre factoid and its outstanding wilderness lead me to an early season bid for the summit. At an altitude of 11,209', Crazy Peak is not the tallest in the state (barely even in the top 50). What makes this peak special is its isolation. 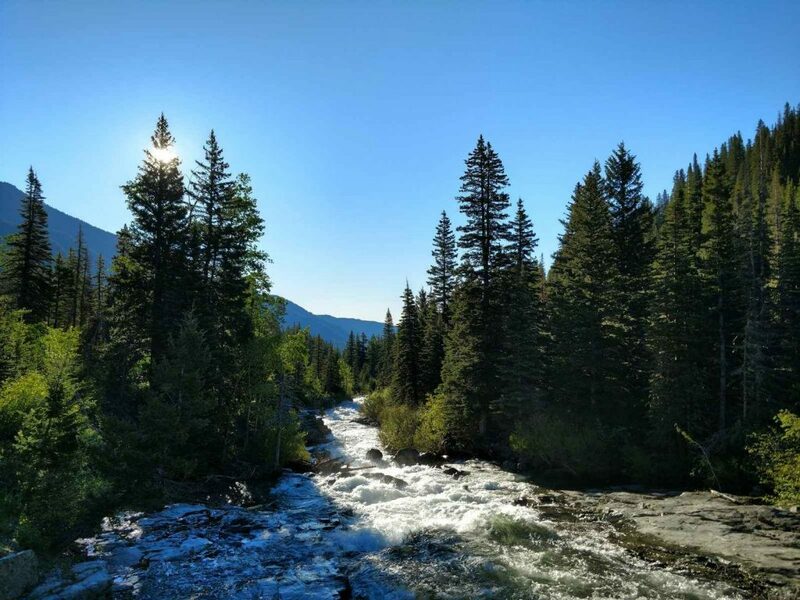 Its entirely surrounded by private land, making access tricky but fortunately legal with landowner arrangements with the National Forest Service. Judging by a limited number of trip reports online, I figured I would be the only one out there, especially in mid-June. 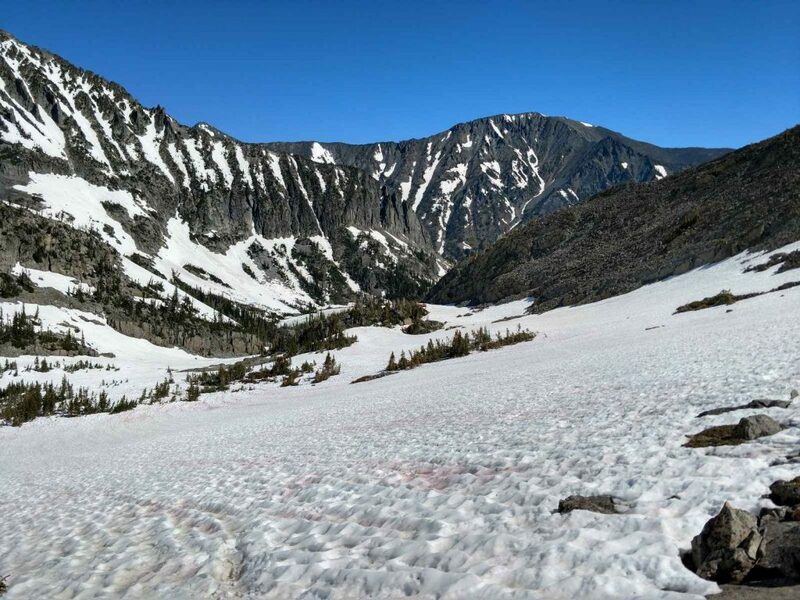 Like many mountains in Montana, snow routinely persists well into August. Hence most climb this mountain in the late summer. Mid-June is definitely considered early season and I knew I'd have my fair share of ice and snow along the route. The West Ridge is the only route I know of that's "established" for this mountain and is about 12 miles round trip with ~5,000ft of elevation gain. Most complete it in a two day trip but I only had one long day. The first part of this route is a steep but straightforward walk up from about 6,400' to about 7,800'. Access is unrestricted though know that the trail crosses private land. It follows a decrepit jeep trail to a poorly marked turnoff into the wilderness. Its about 2.5 miles one way and took me about an hour and a half. 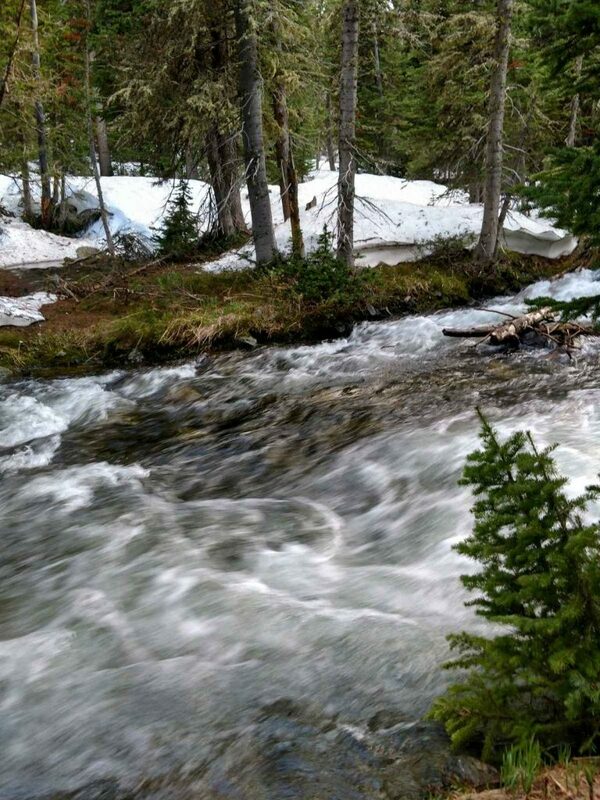 Though a bit of a slog in some sections, the Big Timber Creek ran ferociously high. 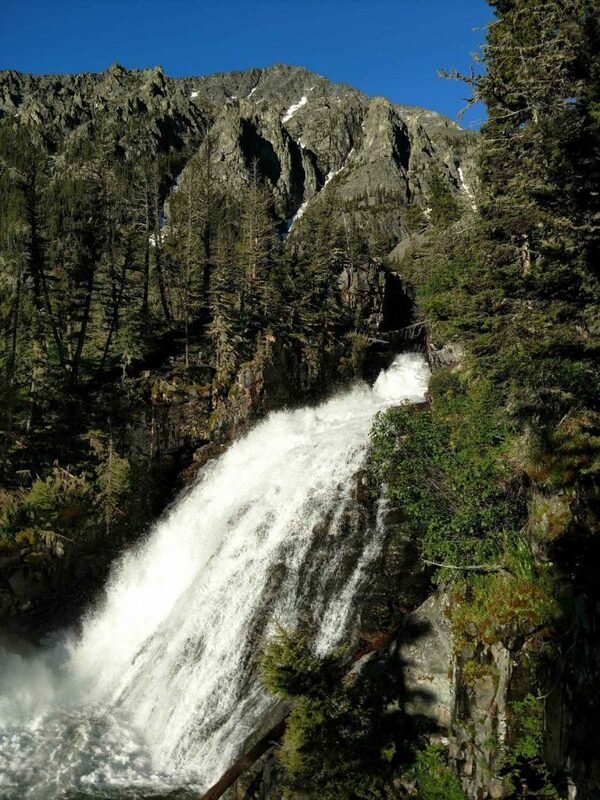 Several cascades and a large waterfall made the strenuous trip enjoyable. I didn't miss the turnoff for the Blue Lake Area but it was not particularly well marked. The sign noted that the maintained trail ended after that turnoff however. This unmaintained trail descended to Big Timber Creek and I found no easy way to cross. With water just barely above freezing and no sunlight this early, I made the icy crossing on barefoot. That was miserable. As far as I know, there isn't an established crossing of Big Timber Creek. A few cross by finding ideal patches of deadfall but this early in the season there was no such luck. Deep snow covered any semblance of a trail from Big Timber Creek to the notch above Blue and Granite Lakes. 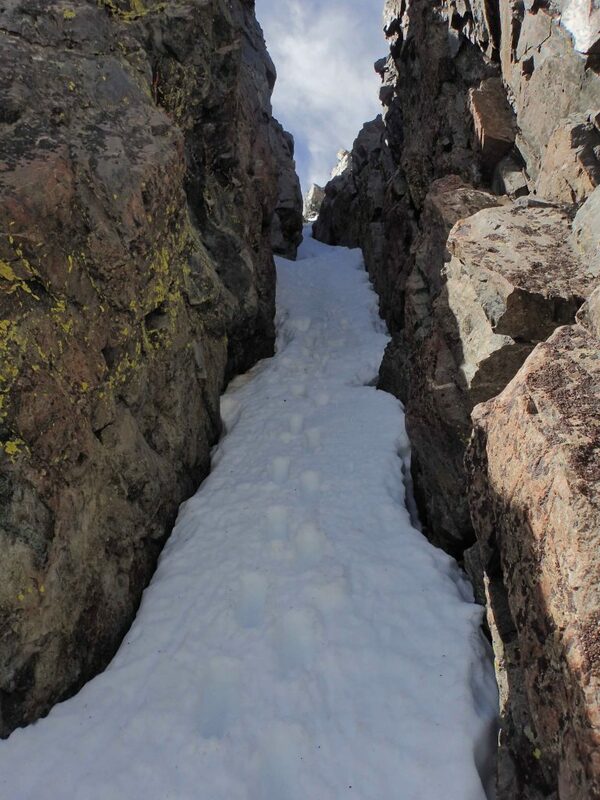 I found this section tricky as there was steep but slushy snow covering crevasse-like sections between large boulders. Every now and then I picked up a bit of a trail but I was mostly on my own. After about an hour, I made it to the two small lakes that I mistook for Granite and Blue Lakes. These are merely unnamed ponds that I only realized once on top of the notch overlooking the larger lakes. I saw evidence of several campsites on that notch. Most spend the night here and get an alpine start the next day. I had my breakfast here and then descended the notch to the saddle between the lakes. This section also held a tricky creek crossing but I lucked out with a fallen tree that crossed the creek. Until now, I was just bare-booting it but the snow became more consistent and firmer so I threw on the micro-spikes. I don't see folks using micro-spikes as commonly out west as I did when I lived in New England. To me, they're a fantastic intermediary between true mountaineering crampons and a bare boot. I flew up the snowfields to the first true scramble of the climb. Like so many scrambles, this section amounts to trying to climb a pile of gravel that's hundreds of feet tall. I don't have any real affinity for scrambles like this except to get to a fantastic view or goal. But I found this section arduous. If there is an established route, I never found it. The one enjoyable part of this section was spotting a mountain goat. Though I felt she was gloating as she danced along the rocks, it was an incredible sight. I've only seen a mountain goat twice for all the mountains I've climbed. Once I achieved the west ridgeline, the entire remainder of climb was visible. Its a true scramble with several exposed sections. I actually liked this section as the rock was mostly good quality and the views were phenomenal. It was slow going to the false summit but thankfully there was less scree. During the climb as well as looking at pictures beforehand over-estimated the difficulty of the West Ridge (looks class IV or V in some sections). I find this true in a lot of trip reports. Pictures only show one perspective of the climb and often they're taken to exaggerate the steepness. So, if you ask me, the climb was a straightforward class III which was exposed but very do-able to somebody who's only recently re-entered the mountaineering world. I'm glad I knew when I topped out on the false summit that I had a ways to go. Distance-wise, its barely a quarter of a mile to the true summit but this is the crux of the route. I took a brief breather here for lunch and to scout the couloir. For the few who have made it this far up the mountain, this section is infamous. The coulior is about a single pitch of descent down an exposed gully of scree or ice depending on the time of year. For probably 10 months it is mostly snow and ice; easily descended with crampons and a mountaineering axe though an un-arrested fall is likely to be deadly. 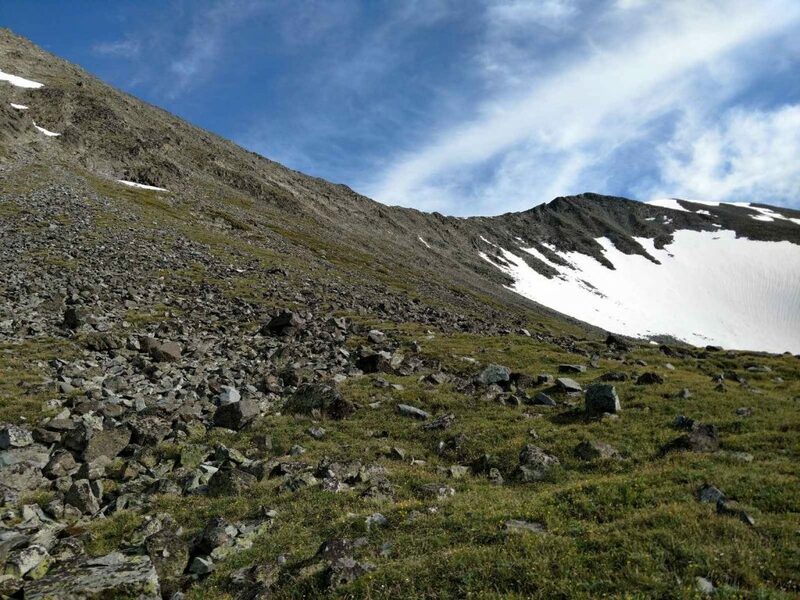 In late July and August, the ice and snow clear out and its a tricky descend down scree and boulders. Between the two, I prefer the ice; worse if you fall but easily descended and climbed. As you see from the photos above, its straightforward though steep. I found the descent more difficult than re-climbing it later. Nevertheless, I found mountaineering crampons and a mountaineering ice ax sufficient for this part. More cautious parties probably rope up in this section. After this, it took another 30 minutes to the top. Its still class III climbing but with considerable exposure, especially in the scree sections. While I didn't feel any desire to be roped in this section, I felt a little queasy crossing the more exposed sections. But I acheived the summit at around 1:30PM, roughly 8 hours after starting. The summit had a characteristically phenomenal view. I even lucked out with weather; no wind and no thunderstorms. I saw the spine of the Beartooth Mountains many miles away in addition to the entire Crazy Range and several smaller ranges to the West and North. Of the few who climbed Crazy Peak and signed the summit register, all of us remarked on the sense of solitude and accomplishment of the ascent. I spent a whole half an hour basking in the view. There's not a lot to add about downclimbing 5,000 feet of what I just ascended. However I ran into a few tricky sections. First, I took a different route between the two smaller lakes and the saddle where the class I trail picks back up. 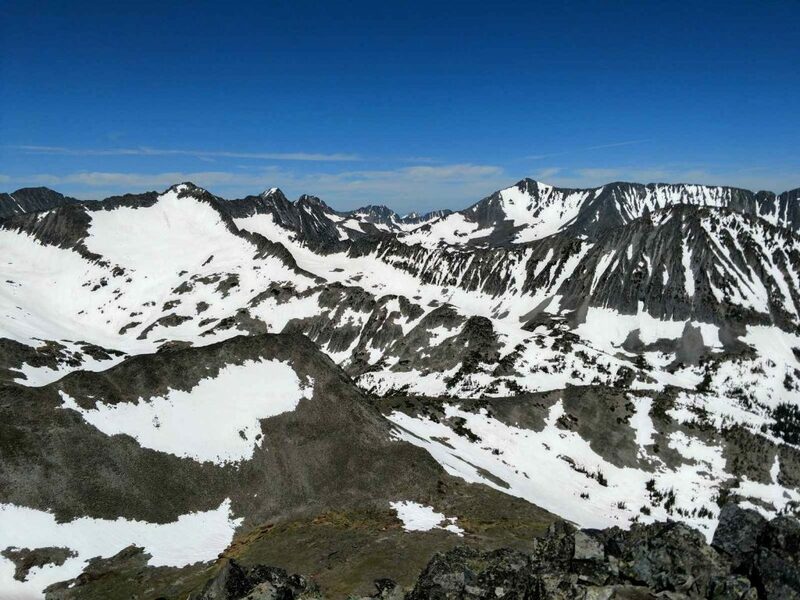 In these condition, I recommend avoiding the lower elevation snowfields- I punched through some very deep and treacherous sections between 9,000 and 8,000 feet. At higher elevations, I basically boot-skiied the snowfield but this isn't possible at lower elevations after the snow softens. I also did not find an easy way to cross the creek at the main saddle. In fact, after 30 minutes of exploring, I found myself crossing fast moving water up to my waist which was horrible after the sun set. Should you climb Crazy Peak, I hope you find an easier way of crossing the creek. Undoubtedly, Crazy Peak was the pinnacle of my Montana Adventures. 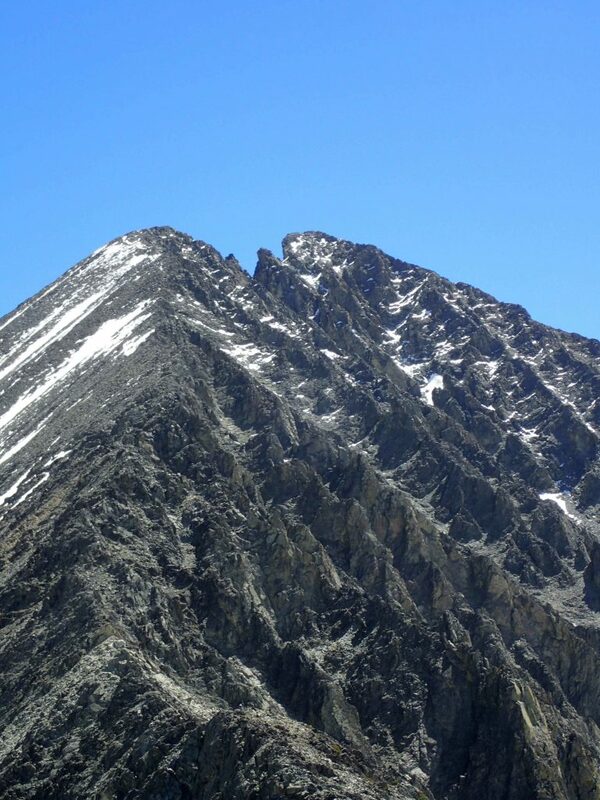 Its isolation and ruggedness hit the spot for my foray back into inter-mountain climbing. 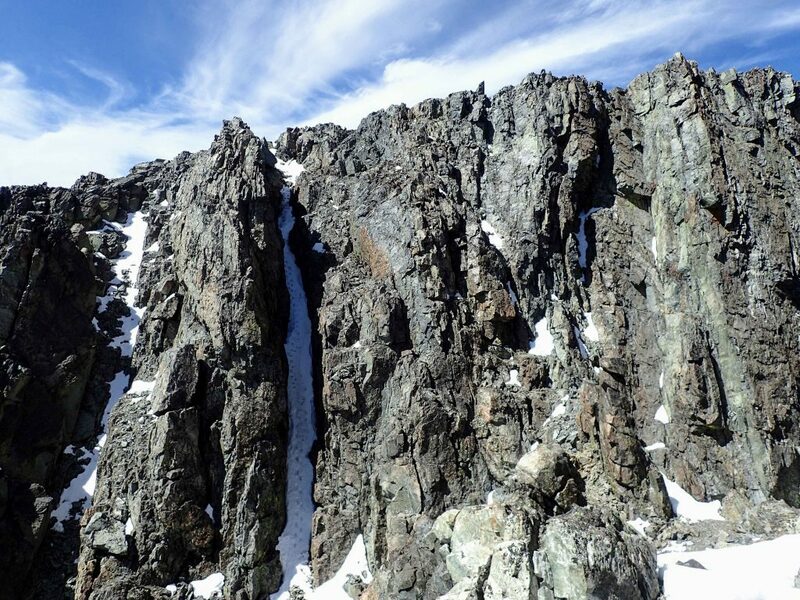 The conditions on a mountain this far North lead to an extremely narrow climbing season. 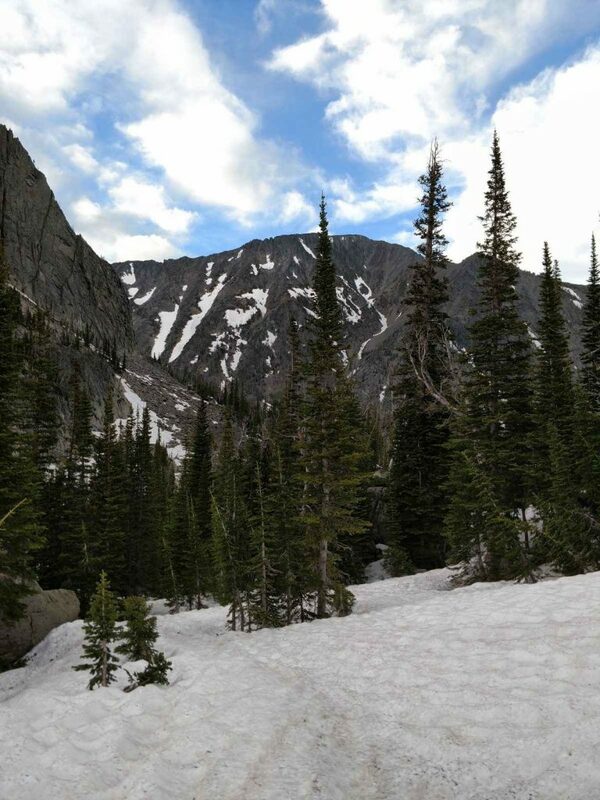 Ideally, I recommend climbing in July or August but I liked that the couloir was snowed-in making for easier traveling. But in the late summer, I imagine that creek crossing is less harrowing. Also, if I had more time I would have split the ascent into a 2 day affair. I camped out at the trailhead overnight and turned my sights to the Beartooth Highway for my last Montana adventures!